Saturday November 21st 1903 I went down town with Will this morning to do some trading came home to get the dinner. He went back to town in the afternoon and I went to Woolfs to spend the afternoon. It was a nice day. I read in the evening went to bed early. 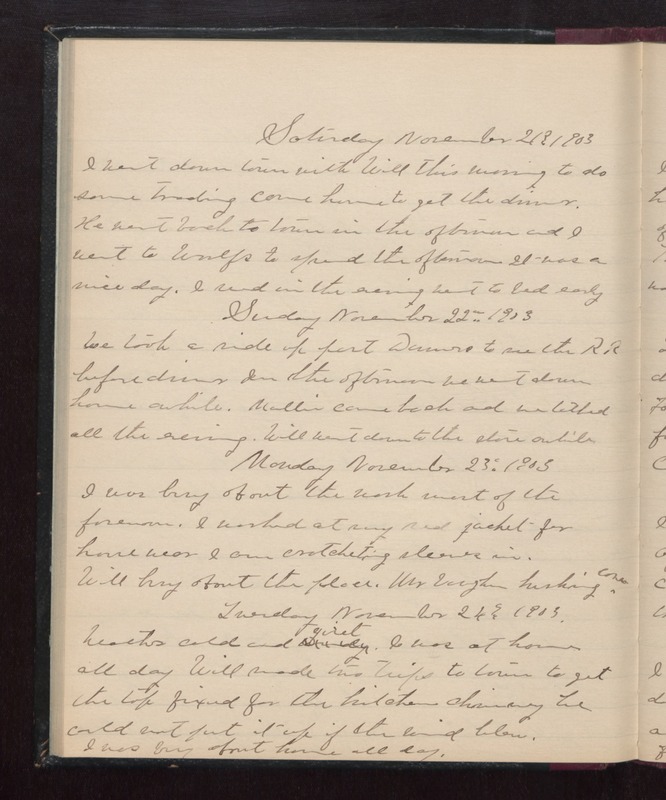 Sunday November 22nd 1903 We took a ride up past Danvers to see the R.R. before dinner. In the afternoon we went down home awhile. Mollie came back and we talked all the evening. Will went down to the store awhile. Monday November 23rd 1904 I was busy about the work most of the forenoon. I worked at my red jacket for house wear. I am crotcheting sleeves in. Will busy about the place. Mr Vaughn husking corn. Tuesday November 24th 1903 weather cold and quiet. I was at home all day. Will made two trips to town to get the top fixed for the kitchen chimney. he could not out it up if the wind blew. I was busy about home all day.